Fort Warren’s “Lady in Black”…Debunked? ‘Tis the season for ghost stories. One of Boston’s most popular is that of the “Lady in Black” who allegedly haunts Fort Warren in Boston Harbor. It has been told and retold over generations. I have read the story in countless publications and heard it around many a campfire. Leaving “ghosts” aside, in hearing the story I have always accepted the “history” behind the tale as generally factual (or at least felt willing to believe that there the might be, as I’ve usually found to be the case, some little kernel of truth to the tale). Turns out there is really not even so much as a kernel to this tale. Fort Warren in Boston harbor was the strongest of the fortifications constructed to defend the capital of the Bay State. Commenced in 1833, construction of the huge pentagonal fort on George’s Island was completed in 1861, just before the start of the Civil War. Never was a shot fired in anger from the fort. However, it served a useful purpose during the Civil War as a training camp for several Massachusetts regiments and, on a more grim note, as a prison for both Confederate soldiers and civilian officials. 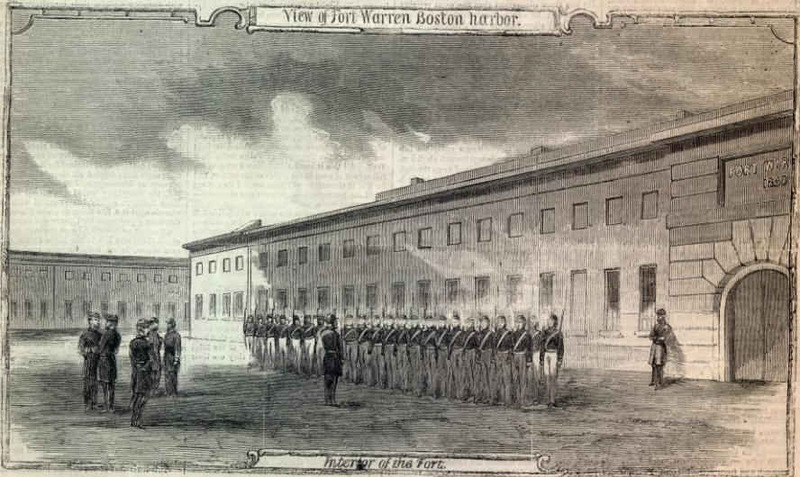 The most famous inmate of Fort Warren was Confederate Vice-President Alexander H. Stephens who was kept there after the war’s end from May to October 1865. A young Confederate officer, identified in some versions of the story as Lieutenant Andrew Lanier and in others as Samuel Lanier, was captured early in the war and became one of the many Confederate soldiers imprisoned at Fort Warren. He was allegedly taken prisoner along with a large number of troops at Roanoke Island, North Carolina. The island was not taken by Union General Ambrose Burnside’s expedition until February 8, 1862 (some versions of the tale put Lanier at Fort Warren late in 1861…but we won’t get hung up on details at the moment). Somehow, Lanier managed to get a message to his young bride, Melanie, whom he had married just months earlier, informing her of the dreadful news that he was imprisoned in Boston. The brave Melanie (who, depending on which version you read, was from South Carolina or Georgia) immediately secured passage on a schooner to Hull, Massachusetts–a curled finger of land jutting into the southern part of Boston Harbor. There she took shelter in the home of a Confederate sympathizer and began to plot her husband’s escape. Somehow, she communicated her plans to her husband within the fort and, on a pre-arranged night, rowed across the mile of water separating Hull from Georges Island dressed as a man. Under the cover of darkness, she made her way to the designated spot along the Corridor of Dungeons and whistled a signal…a popular Confederate tune. The prisoners within lowered a rope, Mrs. Lanier was pulled up and, being extremely slight of build, managed to squeeze through the rifle slit and into the prison block. After an emotional reunion with her husband, the prisoners set about their plan. The idea being to dig a tunnel beneath the parade ground of the fort to the arsenal. Once inside and armed, they would take the garrison by surprise and escape. Unfortunately, their digging was not well planned and they tunneled too close to one of the casemate walls. The soldiers on duty heard the digging and discovered the escape attempt. In the pandemonium that ensued, Melanie Lanier fired a pistol at one of the Union soldiers (some say at the commander of the fort, Lieutenant Colonel Justin Dimick). Something went wrong…either her aim was wild or the weapon exploded in her hand…and her husband was killed. 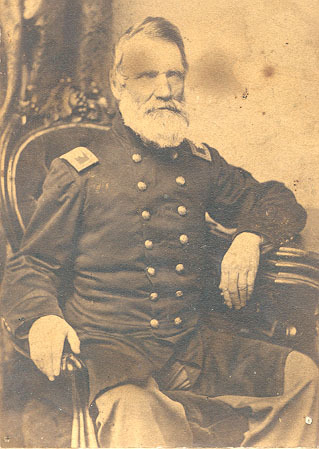 Lt. Col. Justin Dimick (1800-1871), who allegedly condemned Melanie Lanier to death, was a Regular Army officer and veteran of the Mexican War. The inconsolable Mrs. Lanier was allegedly sentenced to death as a spy by Lt. Col. Dimick. Before her hanging, she had one request. She wished to avoid the disgrace of meeting her demise in a man’s clothing and requested something more dignified. Some versions of the story claim that the soldiers managed to find a black dress used for theatricals at the fort. Alternatively, she was given black monk’s robes…another costume for theatricals. Or, in other versions, an officer’s black cloak. No matter which way, she was allegedly dressed in black when she was hung. After her death, many soldiers at the fort claimed to see the mysterious apparition of a “Lady in Black.” Her voice could be heard in the Corridor of Dungeons. Soldiers playing poker observed a stone rolling, inexplicably, across the room. Footprints were spotted in the snow outside the fort, just five of them, coming from nowhere and going nowhere. Some soldiers, according to tradition, were even court-martialed for shooting at a phantom in black and one was brought up on charges for fleeing his post because, he claimed, he was chased by a Lady in Black. These stories run well into the 20th century. It’s a good story. As I said, I usually have found in good folk tales a kernel of truth somewhere and assumed that to be the case here. But I’ve been recently reminded that one should never presume. Author, photographer and artist Jay Schmidt wrote an excellent history of the fort in 2003 entitled, Fort Warren: New England’s Most Historic Civil War Site. The first subject he takes up is that of the Lady in Black. He points out that historian Edward Rowe Snow (1902-1982) was the most avid proponent of the story. Snow, a prolific author of books on New England maritime history and folklore, wrote about the Lady in Black in his 1944 book The Romance of Boston Bay and used to tour groups through the fort, telling the story (complete with costumed accomplices who would leap out and frighten tour-goers). It is Snow’s version of the story from which most of the details are derived and still repeated today. In discussing the Lady in Black, Schmidt wisely did what any historian should do…he consulted primary sources…and could find no period mention of a woman being hung as a spy at Fort Warren. The only woman executed during, or in the wake of the Civil War was Mary Surratt for her role in the conspiracy to assassinate President Lincoln. Surely if a woman were executed in Boston in 1862 it would have been national news. But there is no mention of it in papers. No evidence that the incident happened at all. So, it would seem that one of Boston’s greatest legends is entirely bunk. And I would not criticize Snow for perpetuating a myth especially given that he identifies it as such. Folklore is important. It can muddy the waters of history, but it is valuable to any region’s culture and old tales should be perpetuated. It’s up to the historian to sort through such folklore, to determine what is what, and to clearly identify fact from fiction. Despite the fact that the Lady in Black may never have existed, apparently the sightings continue to this day. Even reputable authorities…police, researchers from MIT, and army personnel have had encounters within the last 40 years or so. If something odd is going on out at Fort Warren, one thing is for certain…it’s not Melanie Lanier. This entry was posted on Wednesday, October 17th, 2012 at 8:26 am	and tagged with American Civil War, American History, Boston Harbor, Boston Massachusetts, Fort Warren, George's Island, Ghosts, History, Hull Massachusetts, Lady in Black, Melanie Lanier and posted in American Civil War, Folklore, Ghost stories. You can follow any responses to this entry through the RSS 2.0 feed. Thanks for commenting. Sounds like there could be a family connection. I guess some genealogical research would shed some light on that. Samuel Lanier was from Beaufort, SC as Kathy shared in an above comment. That would be interesting indeed if you were related. My son is headed to Ft. Warren today. Came home yesterday telling me the teacher told them the story of the “Lady in Black”. When I asked him if the teacher passed it off as the legend it should be and not fact, he told me it was passed off as a true story with no disclaimers. I copied and sent in your article with him this morning. I guess if you hear a story often enough it is true, and this one is embedded in our culture… I wonder if this teacher is going to have the class bring sandwiches for the 2pm train for Charlie who is still stuck on the MTA…….hmmmm. It’s also worth noting that the name Melanie means “black” or “darkness.” I’m thinking someone applied a name and story to a pre-existing spirit, although her clothing as I’ve heard it described sounds like an 1860s widow’s deep mourning costume.